MagnaStor® Enterprise converts regular commercial hard drives into reliable, permanent storage devices. It is an ideal replacement for increasingly aging and obsolete magneto-optical storage. Companies with a need for digital archiving are turning to MagnaStor® to replace their aging and obsolete magneto-optical archiving infrastructure. Contact us today to find out how we can migrate you to a an archiving solution that is less expensive and just as reliable as magneto-optical. 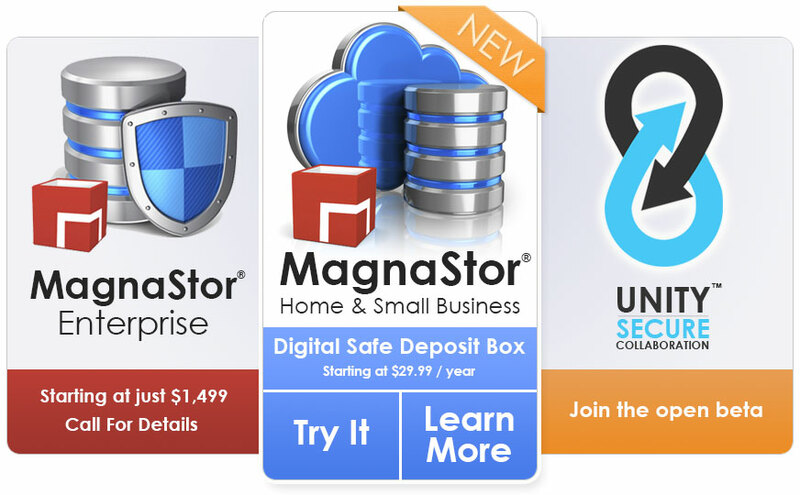 MagnaStor® Home & Small Business allows you to create special drives that protect and preserve your precious digital files. MagnaStor proactively monitors your files, automatically detecting and repairing corruption. Live replication to the Amazon S3 cloud ensures that if disaster strikes, your data remains preserved, protected, and easily recoverable. Create your free trial MagnaStor drive today! Unity is our secure and easy file sharing and messaging system. Everything you share is encrypted. Unlike other collaboration systems, we give you control of your encryption keys, so there are no leaks and no back doors. Now in open beta, we are nearing the public release of Unity. Contact us today to learn more about this powerful collaboration system.